On Monday, at GMT 10:00 a.m., the Eurostat released the month-over-month retail sales figure. It measures the changes in the total value of all sales made at the retail level in the Eurozone over the past month. US binary options traders consider retail sales data to be the primary gauge of consumer spending and confidence. This is because when consumers are confident about their future financial situation, they tend to spend more. Last month, the Eurozone retail sales value decreased by -1.0%. The forecast for this month was set at a 0.3% increase. However, the actual figure decreased by -0.1%. On Monday, at GMT 3:00 p.m., the US based Institute for Supply Management (ISM) released its monthly Non-Manufacturing PMI figure. It measures the level of a diffusion index created by surveying purchasing managers. However, the ISM’s PMI figure excludes the non-manufacturing sector. Last month, the ISM’s PMI figure came out at 59.9. The forecast for this month was set at 58.9. However, the actual figure came out at 59.5. 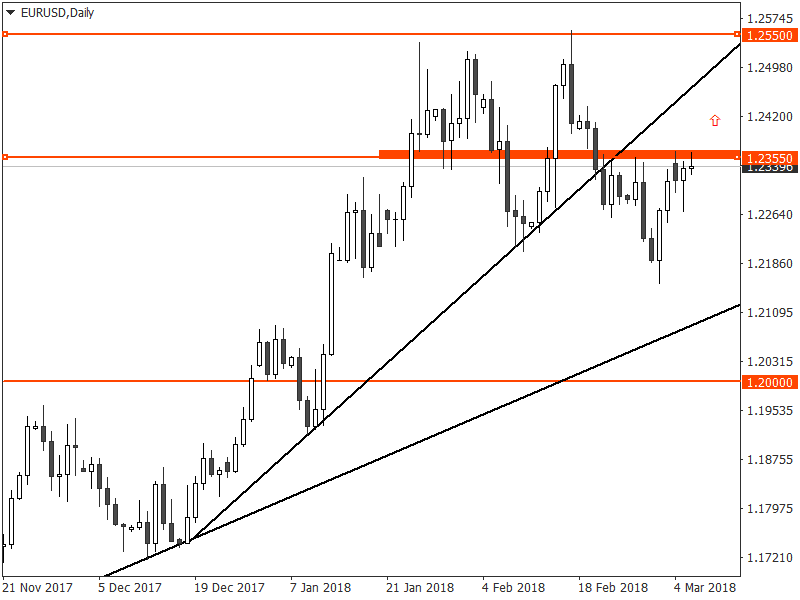 Since forming a pin bar on November 7, 2017, the EUR/USD remained highly bullish and formed two uptrend lines. 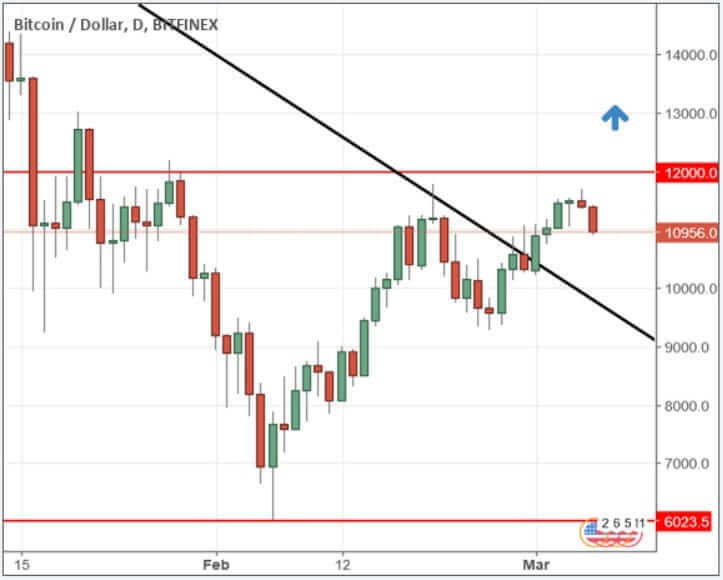 After finding resistance near 1.2550 level, the EUR/USD turned bearish and broke below the first uptrend line on February 21. Last week, the pair formed BUOB on March 1 and started a retracement. Currently, it is trading just below the resistance near 1.2355. The US ISM Non-Manufacturing PMI came out better than expected. On the other hand, the Eurozone retail sales figure decreased by -0.1% against a consensus forecast of 0.3% increase. We believe it would set a bullish fundamental outlook for the EUR/USD this week. Therefore, if the EUR/USD closes above the resistance near 1.2355, it would likely attract additional bullish momentum in the market. Hence, US binary options traders should look out for trading opportunities above this major resistance level around 1.2355. As the BTC/USD fell towards the 6,000 level, it found a strong support. However, in the last few weeks, the BTC/USD started a bullish retracement and broke above the downtrend line. Currently, it is trading just below the resistance around 11,200. Earlier this week, Bank of England governor Mark Carney delivered a speech titled “The Future Of Money” and dismissed the idea that cryptocurrencies will replace fiat currencies like the U.S. Dollar or UK’s Pound in the future. His speech was once again portrayed a negative image of bitcoin going forward. However, given the resilience of bitcoin price against the U.S. Dollar, if the pair breaks above the resistance near 11,200, it will attract additional bullish momentum in the market. Hence, US bitcoin traders should look out for trading opportunities above this major resistance level around 11,200.